There is a bit of reminiscing with this project (and a couple of links to relevant older posts). 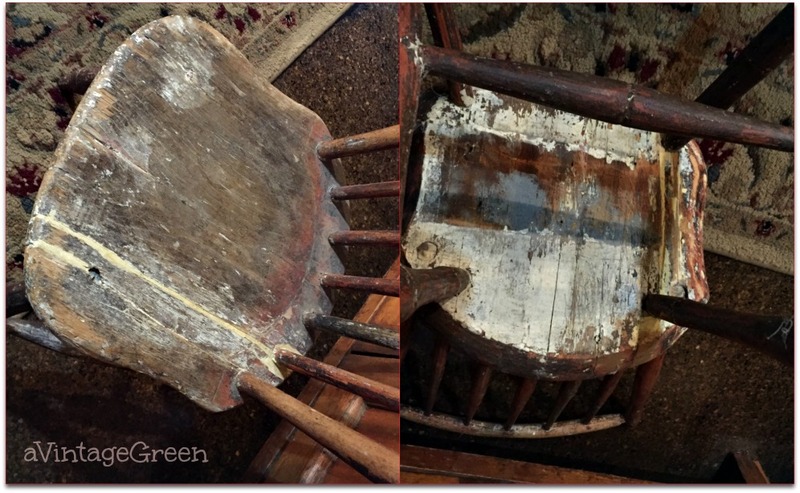 The antique (and repaired) child sized chair has been moved around our house for 15+ years. I love the hand work seen in this small chair (leg sizes not quite identical, inscribed areas not quite the same, wonderful curved piece holding the top of the spindles, colour seems to be oxblood red. I think there was white paint in its past too. Years ago I filled in all the cracks with carpenter's putty (dry powder/mixed with water). That solved the seat split issue and it has stayed that way ever since. I wanted to do as little as possible to this chair so the only changes have been experimenting with what type of color could be used to cover the putty filler to make it blend in somewhat. Stain didn't make any difference so I tried chalk-like paint. I finger painted only the putty areas, first using a damp paper towel to moisten the area and then finger painting the Sedona Red, wiped back, used Beckley Coal and wiped back. I like the way the inscribed curved line on the chair is now visible. The small areas of thin paint did tone down the putty colour and I decided to not make any other changes. 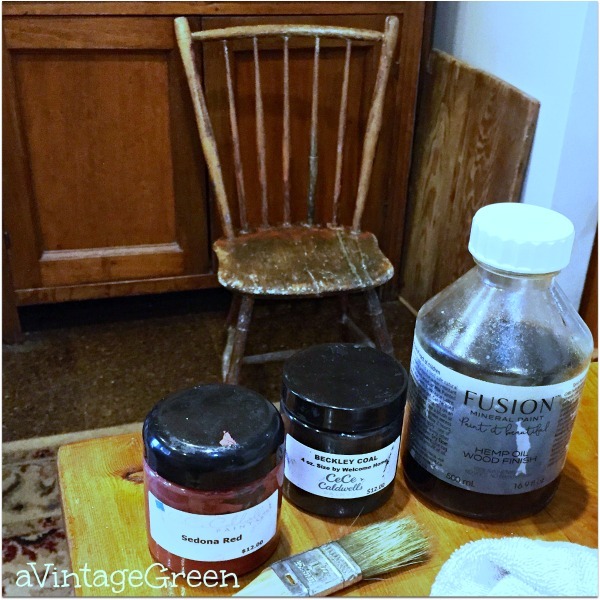 Hand applied hemp oil and then wiped the chair dry again a clean rag. When I was in my 20's I found a very vintage Suzy doll (closing eyes and a mama voice box)- and for some reason added a mohair dark brown wig. This dolly was a replacement for the Suzy I remember burying when I was very young (we were moving and for some reason...) so Suzy has the honour of sitting on the chair along with three very old and not so old dolly blankets and quilts. My sister Gail made the blue and white quilt. I had Suzy sit on primary school chairs in an earlier post. 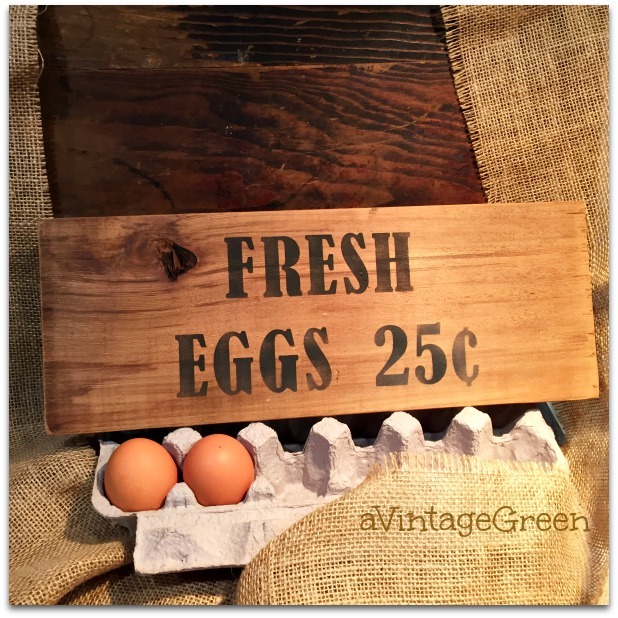 Since this post has antique and very old favourite items I added a "Fresh Eggs 25¢" sign - I have never seen eggs at that price. before I toned down the putty. What an improvement with the hand painting on the putty! Will be stealing that trick in the future. You would have a fun time in our old house and barn. We have old chairs, tables, knick knacks and all kinds of things down there. 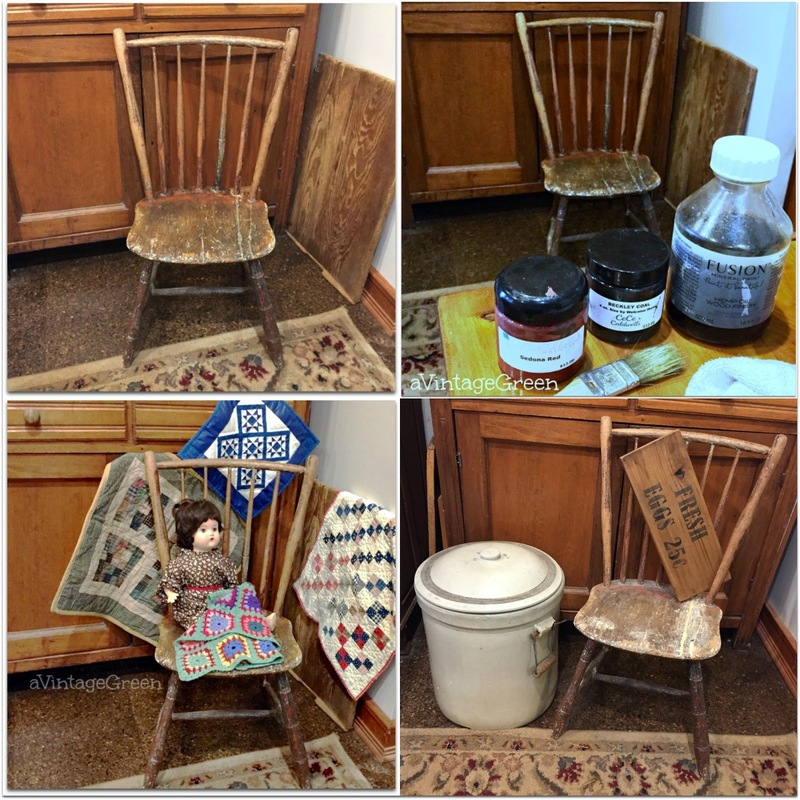 Love the chair Joy, it is so beautiful and I bet it could tell all sorts of stories. I have a small collection of "little chairs" and this one would fit in nicely with mine. Great job in fixing it without altering the age look. Love it. 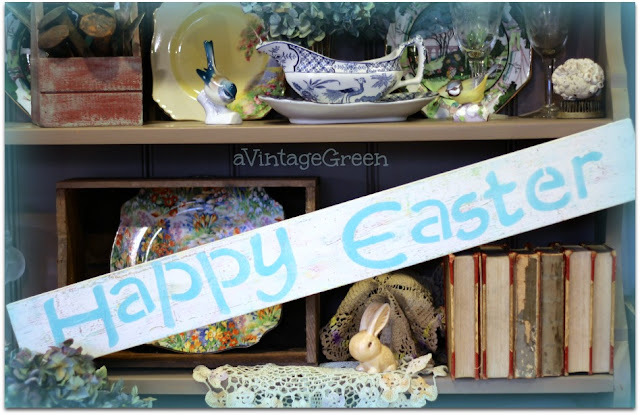 Joy, I always enjoy seeing what antique and old things you are working with this week. A lovely chair. Thanks for sharing. Sylvia D.
That little chair shows lots of use and lots of love. 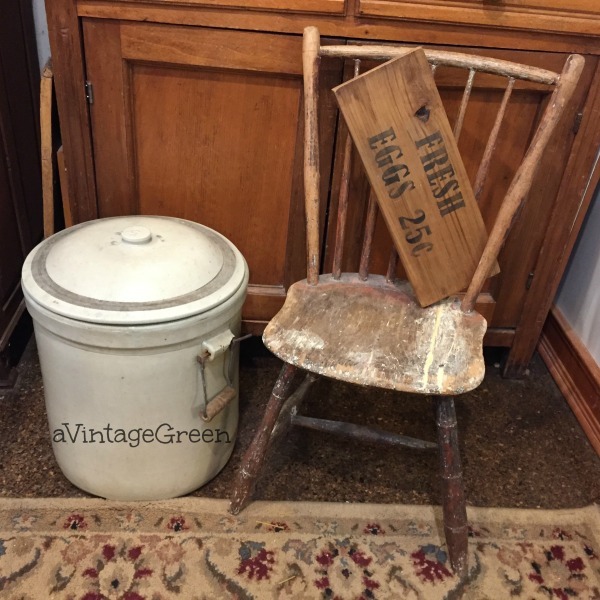 What a cute little chair and I'm so happy to see that it's been restored without being covered in paint. Sometimes the raw, beautiful stories old pieces tell are far more powerful than those that have been covered up. 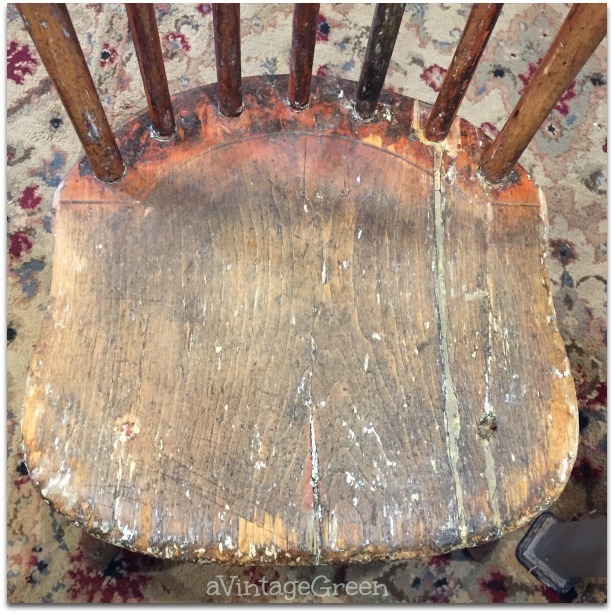 Love the handmade country chair, wouldn't it be grand to know it's history? I can beat your fresh eggs price - I just received a dozen as a gift from our dog sitter courtesy of her free range hens! The "joy" of simple things - a chair and a doll. It makes me merry! 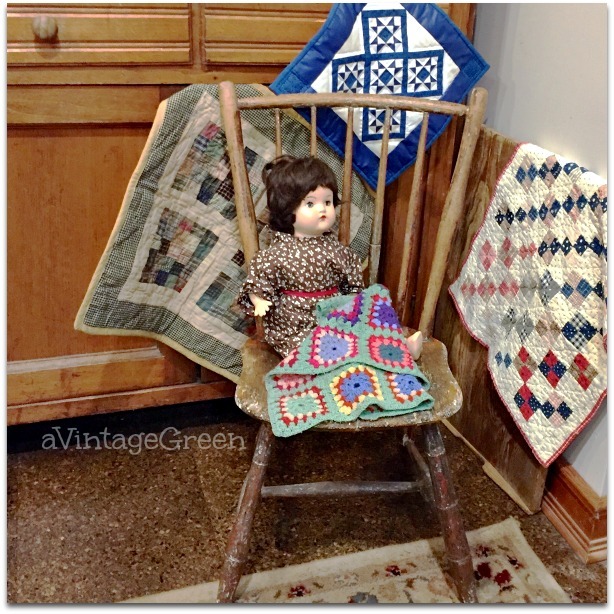 What a lovely vignette - the doll, chair and quilts come together perfectly! thanks for sharing with Awesome Life Friday! 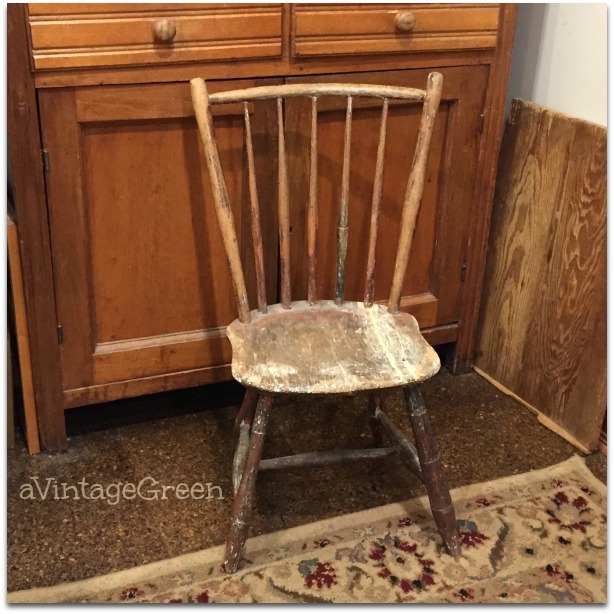 Joy, the chair is so sweet and I love it with just the little bit of color that you added to the putty! The sign and quilts are perfect. Thanks for sharing with SYC. I absolutely love your antique child's chair. It is such a wonderful piece. Thanks for sharing it on Share Your Style. Joy you did a wonderful job blending in the filler and keeping the finish true to its aged character. I love a piece with true patina! Thanks so much for sharing your project at #FridaysFurnitureFix on Thanksgiving day always a pleasure having you! This is a really nice collection, I remember those old Suzy style of dolls, they were wonderful. The chair is really well done.